FNaF World created by Scott Cawthon. FNaF World wouldn’t be a true Five Nights at Freddy’s game without some sort of mysterious undertones, and though they’re largely quashed by zany cartoon graphics here they’re definitely still present - though if you like to mash through text you can miss them completely. While progressing through the game you will periodically run into Fredbear, the cheerful NPC representative who sends you on the quest in the first place. 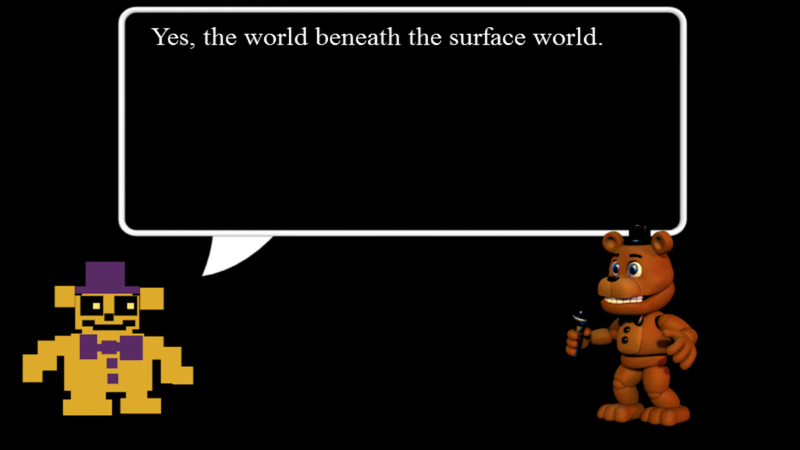 If you wait for Fredbear’s dialogue to exhaust itself each time you will see a big, flashing ‘Done’ button on the screen. DO NOT PRESS THIS BUTTON. If you wait for a while Fredbear will transform into a weirder version of himself, and provide some cryptic - but helpful - hints. The first clock spawn point is triggered by speaking to Fredbear in the west of Fazbear Hills. Once you’ve seen his little glitch screen, head back to the centre of Fazbear Hills and check the woods to the east. The clock is here. Push the Balloon Boy silhouette into the box to complete the task. 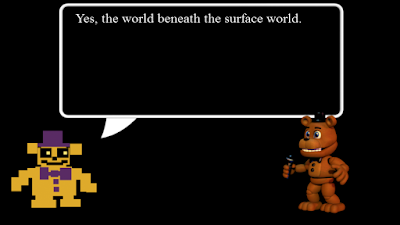 The second clock spawn point is triggered via Fredbear just as you’re entering Choppy’s Woods. He’ll point you to Dusting Fields, and if you proceed with the game normally you’ll find the clock near a Lolbit’s Byte Store. Four white boxes appear near you, and you need to hit them in the proper order - namely, upper left, lower left, upper right, lower right. The third clock spawn point is just after the second clock, and just before you beat Bouncer. Fredbear will point you into Mysterious Mine, the entrance of which is a short trip west of Bouncer. Once inside, head north and take the second left to find the clock. This minigame features four cupcakes; nudge them into the boxes. The fourth clock spawn point is on the edge of Lilygear Lake. Once again, Fredbear points you into Mysterious Mine, though through a different entrance. Wade into Lilygear, wander north, and then head west to find the Mine. Once inside, take a right and head south at the first intersection to find the clock. This minigame features three boxes that trigger codes. You want to stand on the middle box, which displays the code ‘395248’. The fifth and final clock spawn point is on the edge of Blacktomb Yard, just as you’re entering. Fredbear points you into Pinwheel Circus, which requires progressing through the game and into Deep-Metal Mine. Once you’ve reached Pinwheel Circus, enter Pinwheel Funhouse, the final dungeon of the game, and pop through the first few tents to find the clock. It’s in a grassy area with three tents. Once again, it’s a simple pushing-into-the-box game. After navigating through Pinwheel Funhouse you’ll find a warp that will take you to a Key. The Key allows you to unlock doors found throughout the world, including one that seems to lead to nothing - that is, unless you found all five clocks. It’s located in the north of Lilygear Lake, along the same path you took to get to the fourth clock. If you completed the minigames properly there will be a warp behind the lock. Step inside to trigger the ending. If you don't the clocks won't appear. Yes. It's one of the children. I will help you as soon as i get done homework. do i have to make another save to get these clocks? If i accidentally clicked done, will the clock spawn? I did this in the 3d fnaf world and I didn't see the portal so tell me can I do it on hard mode? Yes, you can, did you get all five clocks and do all of the minigames before time ran out? What did the ending meaaaaan.... any ideas? You need to stand on the middle switch in the 4th minigame if you werent standing on it. I think it is somewhat connected to fnaf 4's ending of night 6. Do I NEED to be on Hard mode to trigger the warp? I didn't stand on the middle box in the 4th mini game can i still get the warp? how do i get back to it if no? Is the glitched thing the warp? I can't tell. Do you have to trigger all of the box’s for the 4th clock, then stand on the middle or?? ?